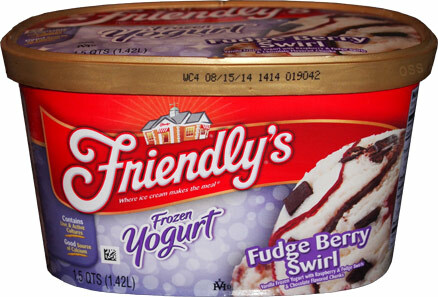 As we continue our quest to find interesting flavors that we've overlooked, I decided to pick up some Friendly's frozen yogurt. What can I say, you can't eat super premium all the time. It's nice to look at a bowl of the frozen stuff and go "yeah, one more scoop won't hurt me". So the first scooping of this ice cream was a very small sampling, just enough to grab this photo. It was a so-so introduction to this flavor. I definitely detect a froyo texture, so it's not real creamy, and then there is the flavor. While I may love chocolate and raspberry individually, it's rare for me to find a happy combo of them together. All too often, I'm left with that somewhat un-amusing, kind of fake, iffy chocolate covering a blah, fake-ish, raspberry filling truffle flavoring that just doesn't do anything for me. It reminds me of the disappointing raspberry truffle blizzard. Ahhhh, I expect too much sometimes I guess. On Second Scoop: Alright, a much larger serving sits before me. I will admit that this is a pretty neat looking flavor. 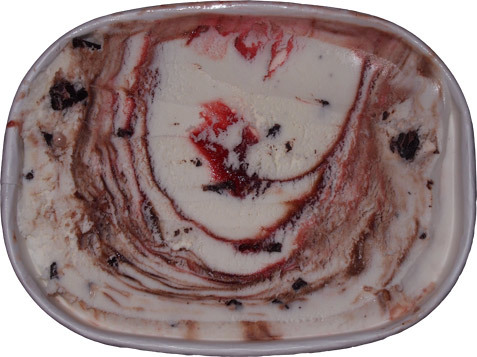 Tons of swirls, good size chocolate chips, and definitely not shy on flavor. If I had to put my initial complaints another way, I'd have to say that maybe this one is too busy. 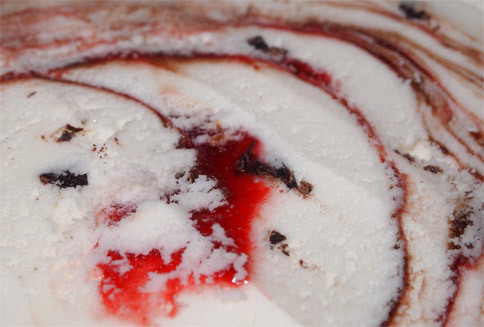 The texture of the potent swirl kind of amplifies the non-creamy texture. Also, despite having four components, it's really just one flavor coming across, that so-so chocolate raspberry flavor... wait, does that still count as one flavor? I get that it's two flavors, but they are permanently stuck together. I'm pretty sure the thick chocolate chips are my favorite part. They have a nice thud and sometimes you find a nice grouping of them. Ahhh, maybe I'm being too hard on this one. There is definitely a big chunk of me that likes this despite my several complaints. On Third Scoop: This one is still growing on me a little bit each time I try it. It's not my usual thing, but as a froyo, you have to give it some props. My wife likes it too.